C’mon, Who Really Wrote it? : John Button and Leslie McFarlane in 1938 — Wait, what? Leslie McFarlane took a break after this one, as he really wanted to do as he didn’t think much of these “juveniles” that he wrote for money. So this one was partially written by him and partially by Button (unbeknownst to McFarlane). Editing mixed them together into a bit of a mishmash. Don’t worry, though, McFarlane will be back for another few books starting with #22. For now, it’s Mr. Button. Was It Revised? : Yes, in 1966 by James D. Lawrence, one of three he revised and the second in a row after A Figure in Hiding. 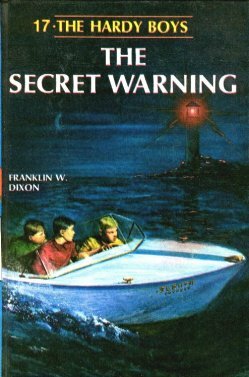 Cover: Rudy Nappi, red and yellow as is typical, but this time the Sleuth is shown in a gorgeous night shot with the lighthouse in the background. Very solid cover. Setting: Bayport and its surroundings, with a couple of jaunts to Manhattan. Where’s Fenton This Time? : As usual, on a case that is related to this case. Which Chums Show Up? : Chet a bit, Biff, Tony, Jerry, Phil, Iola and Callie for brief stretches. What’s Chet’s Hobby This Time? : None, he must be bored. Aunt Gertrude’s Dessert: Nothing. Again! Tivoli the Great Dane gets treated better than the boys in this one. I’ve already posted a complaint to the Great Dane Society, so relax. Plot: A King Tut-like golden bust worth — pinky to mouth — ONE MILLION DOLLARS, a sunken ship near Bayport (natch), a couple of rival deep sea divers, you know, the usual. Review: Doesn’t read like a pure McFarlane, that’s for sure. This one has all the characters, but it’s off. I do like the climax though where some kindness shown comes back to reward the boys. It’s not a typical climax, it’s more of an adventure at sea ending, not the crooks holding a gun to the boys ending. You know what I think? In 1966 James Bond was HUGE. Thunderball had already come out with its Oscar-winning underwater photography of skin divers fighting. I’m guessing the rewrite tried to capture a bit of Thunderball.